1984's "The Karate Kid" is a classic. It's timeless, and has been enchanting audiences for the last 26 years with its purity of heart, meaty characterization, flavorful acting, and victorious deployment of underdog formula. It's a heartwarming, beautifully realized motion picture, created during an era when such lofty displays of sincerity could still be treasured and celebrated by the mass audience. There was no need for a remake. However, a brand name is a brand name, so Hollywood has decided to dust off the original screenplay, change a few names and locations, and reheat the premise with a new cast, hoping to entice the nostalgic and indoctrinate the young. Frankly, I feel bad for anyone taking their first taste of "The Karate Kid" with this mechanical, charmless update. Arriving in China from Detroit for a fresh start, Sherry (Taraji P. Henson) and son Dre (Jaden Smith) have a lot to learn about their new surroundings, which makes the 12-year-old boy very nervous. When an innocent flirtation with a local girl raises the ire of neighborhood bullies, Dre is targeted for daily beatings, eventually piquing the curiosity of handyman Mr. Han (Jackie Chan). Offering to help train the boy in the ways of kung fu, Mr. Han carefully introduces Dre to the repetitive movements of the martial art, while teaching lessons of respect. Working to a tournament where Dre will face his aggressors and their violent teacher, the boy must confront his fears, control his strengths, and trust in Mr. Han for guidance, not only for victory, but to achieve a special confidence that friendship brings. The modern "Karate Kid" isn't fooling around: It's nearly a scene-for-scene remake of the 1984 picture, with only minor deviations in plot and characterization. Christopher Murphey's script is one long case of déjà vu, refusing a clear invitation to open the story up and pursue new challenges and moods. Instead, the script crudely traces over Robert Mark Kamen's original work, figuring a few cosmetic changes will be enough to lasso in a whole new audience. My displeasure with "The Karate Kid" isn't entirely based on its remake DNA, but the tone-deaf way it conducts the same old business. The original film was a slow-burn affair that took its time establishing the characters, conflicts, and locations. The do-over speeds the connections up to such a degree, all nuance is lost. The friendship between Dre and Mr. Han should be a flowering connection that fills an emotional void in both their lives; Murphey's script gives them all the chemistry of a blind date, sprinting through the stages of the partnership to get to the hero highlights of the first picture. The corner cutting is exasperating after the first act, where it suddenly dawns that Zwart doesn't care about the personalities, only their iconic positions in the formula. The training sequences are shallow and unresponsive, with the 2010 film trying to replicate the effect of mundane busywork as a cornerstone of martial arts discipline. What was once "Wax on, wax off" is now "Jacket on, jacket off," and the timing of the big reveal is accelerated. 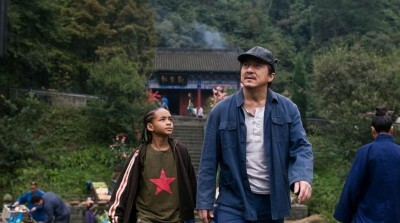 The 1984 film used the surprise of Mr. Miyagi's chore-based education as a way to snap the audience to attention; the 2010 picture triggers the revelation early, negating the comprehensive adventure and frustration of Dre's kung fu tutoring. In place of building a strong foundation, the update assumes a more mystical path, with magic yin-yang water and a cobra-taming finishing move to match the all-powerful crane kick. Harshly comparing the two films might register as unfair to some readers, but the 2010 version doesn't sweat hard enough to be its own film and explore its own world. The move to China is meant to crack some fresh air into the franchise, but Zwart doesn't understand how to exploit the alien factor of the land, having Dre and his mother adapt to their surroundings with ease. The rest of the film concentrates steadily on rehashing the emotional beats and training woes of the 1984 feature, hoping to entice a new round of fans with 26-year-old moves. Even Miyagi's powerful scene of drunken confession is trotted out for a second lap, this time highlighting Mr. Han's devastation over a car accident, which compels him to wreck and repair an automobile as his yearly penance. Here is a clear difference between the two scripts: the first places a face on a horrendous period in Japanese-American history to unearth Miyagi's pain, the remake hands a shadow of a character warm cliché to seize the same sympathy. Needless to say, if the acting were as satisfying as before, complaints would be in short supply. As it stands, Smith and Chan lack chemistry as Dre and Mr. Han, solemnly going through the paces without much in the personality department. Stillborn emotions are expected from Chan (he's never been much of an actor), but Smith is handed a plum role and all he can do is channel the shtick his father Will made famous. Smith lacks humility to play the underdog, doing more posing than reflection, trying to play it cool when the character is anything but. The new "Karate Kid" is careful not to render Dre as any sort of dork, making the character's budding confidence redundant. It's a disappointing performance from a young actor who doesn't have the chops to carry his own movie. There's nothing to cheer for with Smith, who claims victory from the start. At least with Ralph Macchio (who originated the role as Daniel LaRusso) there was vulnerability, mischief, and angst. Smith looks like he boldly stepped out of a hip-hop video, making any rooting for the bullies to win not entirely uncalled for. All the pieces are here from 1984, including the massive martial arts tournament conclusion with Dre facing his enemies and a special fire-based healing touch from Mr. Han to keep his student in the game. As with any remake, if you've seen the original film, you know what's coming, if the remake's your first glimpse of the story, you're witnessing an inferior version. Over the course of 140 minutes, it's easy to recall just how well the original film covered the exact same ground. The final insult? There's no karate to be found in the film. How's that for truth in advertising. Buy tickets to "The Karate Kid (2010)" now!